These are such nice amps. Small but not too small on the tone. Perfect for small rooms and recording. The best speakers they came with was the better Oxford 10L5 and the C10N Jensen. The Jensens hold up the best and sound the best especially the C10N. Some came with the C10Q or R. If you get a chance to play one with a nice set of RCA 6V6GTs and a C10N Jensen you won’t be dissapointed. One of Fenders best! my friend found one and bought it at an auction for 600 dollars..we verified the codes and it is a ’66..my question is why does it say on the frontpiece design and circuts patent 68? I have a BFPR, date code PK. It has the gold label Fender Jensen. The circuit is an AA764 and it uses a GZ34 rectifier. Prod #90. Splain that! I have too a BFPR, date code PK ( for november 1966 ?) too and Prod #90 too !! A good one too ! What a confusing mess!!! Ive been looking for about 3 hours solid to find out what year my blackfaced Princeton amp is and I still don’t know. I think its a 71′ but I bought it for $600 and the listings for the 71 are around $1,200 to $1500. How can I know for sure..I guess we’ll never know!!!??! RCMC, Yes it is tough to tell what year exactly each of the amps are, the current data we have will display dates under the photo: IE: Production: 1964, 1965, 1966, 1967. However it’s possible these dates do not encompass all available models. If you have information that we should correct let us know! I have two Fender speaker 220633 023010 C8306 come from Fender Princeton amp. Can I use this two to change into my 66′ Vibrolux Reverb amp? Can this speaker (x2 double) handle the power of 35W which the specification mentioned. Mine is a 1966 stamped ‘OK’ on the tube chart with the correct knobs (screw at no 1 position and snowman style no 8) and has 2×8″ Jensens which are labeled ‘Made in USA’ by Jensen Chicago ! Explain that ! I loaned a BFPR to a friend of mine in 1978. It was my first amp I ever bought for myself. Now get this. I talked to him on the phone yesterday and he mentioned the thing an said he still had it and would to get it back to me. I got up at 6 this morning and drove down there to wake him up. I know have it in my possession. I’m quite stoked about this. It by all means needs new tubes and a major clean up. But all the knobs and everything thing original is there. A bit worse from the ageing process and needs some help. But the screen cloth isn’t torn and it has a little mouse chew damage on the spring reverb cover and the bottom of the Tolex needs to be glued back on. Anybody got any valid input in regard to the year it was born. But again. I’m pretty stoked and now have a project and one I have often thought of over the last 37 years many times. 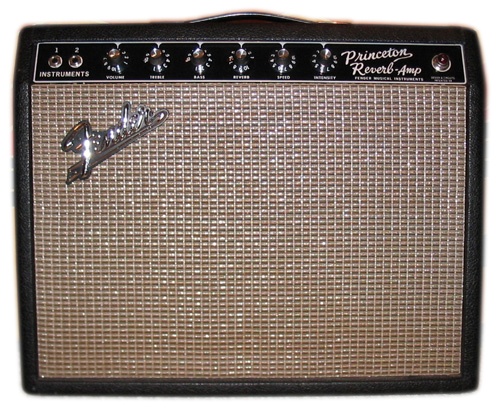 My first amp was a 1966 or 1967 Fender Princeton Reverb from the pictures I am looking at. I still have it. When I was 16 or 17 back in the early 80’s (when I didn’t know any better) I had the speaker replaced rather than re coned. I didn’t keep the original speaker. How badly does this affect the value?…and is it pretty hard to find an original speaker? anyone know what the value is with the new speaker and what it would be if I kept the original. BTW I have no plans on ever selling it anyway). The repairman convinced me to get a new speaker instead of re cone. My Princeton Reverb blackface has the QD date stamp indicating April 1967. However the speaker date code is 137-6801 indicating CTS speaker first week of 1968. Can anyone explain this? The speaker was changed…either from defect, or couldn’t handle the use. My cousin bought a Bfpr in the middle sixties. The original loudspeaker died after a couple of months and the amp was abandoned in storage. Last year i founded that little engine and i replaced the original speaker with a Jensen P10R. Could you ever imagine how that almost unused amp sounds…? No matter what guitar you plug in.